Stand Up Paddle Surfing: Zoey crankin' a lipper with human on board! 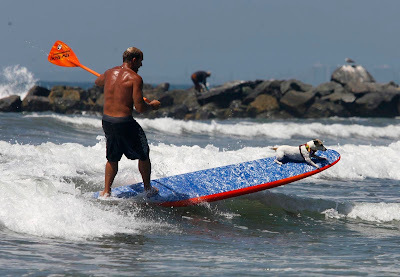 Denis Poroy sent me this photo of Scott Chandler surfing with Zoey the Jack Russell terrier. Hey Zoey, too bad that dude's on the back or you would've gone fins out on that turn! Check out the drops of water coming off of Scott's paddle blade; Poroy's a pro and has a gnarly camera (kind of like Spicolli's Dad who had a "gnarly set of tools"). I think that's what is known in the trade as "tack sharp".